I went for a run in Funafuti. Being a narrow atoll, you have two options upon leaving the hotel: turn left or turn right. I had decided to do a long run so it was to the left. 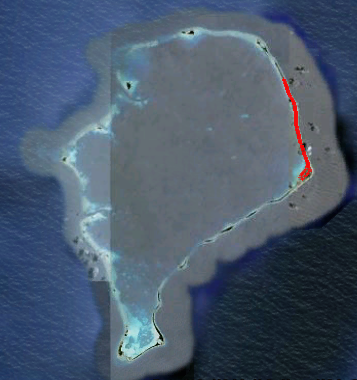 Eight kilometres later and the road ended; that is the length of the island (the red line in the satellite image below). Had I turned to the right it ends just over three kilometres. So just enough to do a half marathon by running to both ends of the island. One really gets a sense of perspective on just how small Funafuti atoll is when you are standing on the one road and the island is less than 40 metres wide. But besides reflecting on how small the place was, what my really brought home was the problem with garbage. Never before have I seen so much in such a small area. You are currently browsing the World Bank Traveller blog archives for March, 2012.